We recently sat down with CJ Moses, Deputy, Chief Information Security Officer (CISO), to learn about his day-to-day as a cybersecurity executive. He also shared more about his passion for racecar driving and why AWS is partnering with the SRO GT World Challenge America series this year. How long have you been with AWS, and what is your role? I’ve been with AWS since December 2007. I came to AWS from the FBI, along with current AWS CISO Steve Schmidt and VP/Distinguished Engineer Eric Brandwine. Together, we started the east coast AWS office. I’m now the Deputy CISO and VP of Security Engineering at AWS. What excites you most about your role? I like that every day brings something new and different. In the security space, it’s a bit of a cat and mouse game. It’s our job to be very much ahead of the adversaries. Continuing to engineer and innovate to keep our customers’ data secure allows us to do that. I also love providing customers things that didn’t exist in the past. The very first initiative that Steve, Eric and I worked on when we came from the government sector was Amazon Virtual Private Cloud (Amazon VPC), as well as the underlying network that gives customers virtually isolated network environments. By the end of 2011, the entire Amazon.com web fleet was running on this VPC infrastructure. Creating this kind of scalable offering and allowing our customers to use it was, as we like to say, making history. We continue to work on new features and services that make it easier to operate more securely in the cloud than in on-premises datacenters. Over the past several years, we’ve launched services like Amazon GuardDuty (threat detection), Amazon Macie (sensitive data classification), and most recently AWS Security Hub (comprehensive security and compliance status monitoring). I love working for a company that’s committed to paying attention to customer feedback—and then innovating to not only meet those needs, but exceed them. What’s the most challenging part of your role? Juggling all the different aspects of it. I have responsibility for a lot of things, from auditing the physical security of our data centers to the type of hypervisor we need to use when thinking about new services and features. In the past, it was a Xen hypervisor based on open source software, but today AWS has built hardware and software components to eliminate the previous virtualization overhead. The Nitro system, as we call it, has had performance, availability, and security engineered into it from the earliest design phases, which is the right way to do it. Being able to go that full breadth of physical to virtual is challenging, but these challenges are what energize and drive me. You’re an avid racecar driver. Tell us a bit about why you got into racing. What are the similarities between racecar driving and your job? I got into racecar driving years ago, by accident. I bought an Audi A4 and it came with a membership to the Quattro club and they sent me a flyer for a track day, which is essentially a “take your streetcar to the track” event. I was hooked and began spending more and more time at the track. I’ve found that racecar drivers are extremely type A and very competitive. And because Amazon is very much a driven, fast-moving company, I think that what you need to have in place to succeed at Amazon is similar to what you need to be great on the racetrack. I like to tell my AWS team that they should be tactically impatient, yet strategically patient, and that applies to motorsports equally. You can’t win the race if you wreck in the first turn, but you also can’t win if you never get off the starting line. Another similarity is the need to be laser-focused on the task at hand. In both environments, you need to be able to clear your mind of distractions and think from a new perspective. At AWS, our customer obsession drives what we do, the services and offerings we create, and our company culture. When I get in a racecar, there’s no time to think about anything except what’s at hand. When I’m streaming down the straightaway doing 180 mph, I need to focus on when to hit the brakes or when to make the next turn. When I get out of that car, I can then re-focus and bring new perspective to work and life. AWS is the official cloud and machine learning provider of the SRO GT World Challenge America series this year. What drove the decision to become a partner? We co-sponsored executive summits with our partner, CrowdStrike, at the SRO Motorsports race venues last year and are doing the same thing this year. But this year, we thought that it made sense to increase brand awareness and gain access to the GT Paddock Club for our guests. Paddock access allows you to see the cars up close and talk to drivers. It’s like a backstage pass at a concert. In the paddock, every single car and team has sponsors or are self-funded—it’s like a small business-to-business environment. During our involvement last year, we didn’t see those businesses connecting with each other. What we hope to do this year is elevate the cybersecurity learning experience. We’re bringing in cybersecurity executives from across a range of companies to start dialogues with one another, with us, and with the companies represented in the paddock. The program is designed to build meaningful relationships and cultivate a shared learning experience on cybersecurity and AWS services in a setting where we can provide a once-in-a-lifetime experience for our guests. The cybersecurity industry is driven by trust-based relationships and genuinely being there for our customers. I believe our partnership with the SRO GT World Challenge series will provide a platform that helps us reinforce this. What’s the connection between racecars and cloud security? How are AWS Security services being used at the racetrack? With racing, there are tremendous workloads, such as telemetry and data acquisition, that you can stream from a car—essentially, hundreds of channels of data. There are advanced processing requirements for computational fluid dynamics, for example, both of air dynamics around the outside of the car and of air intake into and exhaust out of the engine. All these workloads and all this data are proprietary to the racing teams: The last thing you want is a competing racing team getting that data. This issue is analogous to data protection concerns amongst today’s traditional businesses. Also similar to traditional businesses, many racing teams need to be able to share data with each other in specific ways, to meet specific needs. For example, some teams might have multiple cars and drivers. Each of those drivers will need varying levels of access to data. AWS enables them to share that data in isolation, ensuring teams share only what’s needed. This kind of isolation would be difficult to achieve with a traditional data center or in many other environments. AWS is also being used in new ways by GT World Challenge to help racecar drivers and partners make more real-time, data-driven decisions. For the first time, drivers and other racing partners will be able to securely stream telemetry directly to the AWS cloud. This will help drivers better analyze their driving and which parts of the course they need to improve upon. Crew chiefs and race engineers will have the data along with the advanced analytics to help them make informed decisions, such as telling drivers when it’s the most strategic time to make a pit stop. This data will also help enhance the fan experience later this year. Spectators will be privy to some of the data being streamed through AWS and used by drivers, giving them a more intimate understanding of the velocity at which decisions need to be made on the track. We hope fans will be excited by this innovation. 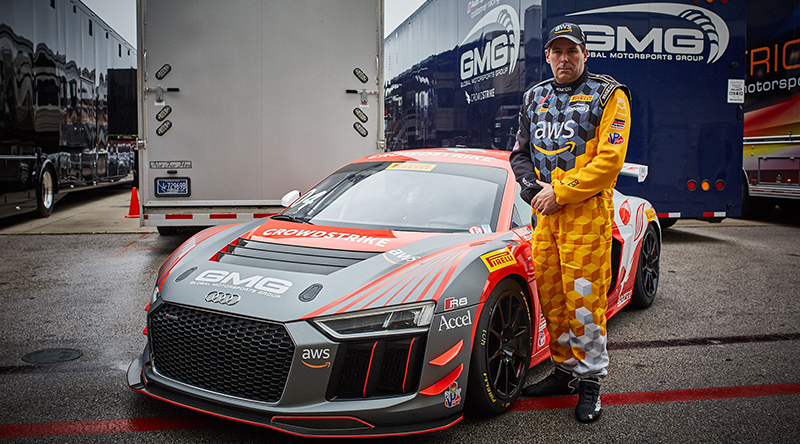 What do you hope AWS customers will gain from attending GT World Challenge races? I think the primary value is the opportunity to build relationships with experts and executives in the cybersecurity space, while enjoying the racetrack experience. We want to continue operating at the speed of innovation for our customers, and being able to build trust with them face-to-face helps enable this. We also keenly value the opportunity for customers to provide us feedback to influence how we think and what we offer at AWS, and I believe these events will provide opportunities where these conversations can easily take place. In addition, we’ll be teasing out information about AWS re:Inforce (our upcoming security conference in Boston this June) at the GT Paddock Club. This includes information about the content, what to expect at the conference, and key dates. For anyone who wants to learn more about this event, I encourage them to visit https://reinforce.awsevents.com/, where you can read about our different session tracks, Steve Schmidt’s keynote, and other educational experiences we have planned. How are you preparing for the races you’ll be in this year? I’ve never raced professionally before, so driving the Audi R8 LMS GT4 this season has been a new experience for me. I’ve got my second race coming up this weekend (April 12th-14th), at the Pirelli GT4 Challenge at Long Beach, where AWS is the title sponsor. To prepare at home, I have a racing simulator that uses AWS services, as well as three large monitors, a steering wheel, pedals, and a moving and vibrating seat that I train on. I take what I learn from this simulation to the track in the actual car any chance I get. As the belated Jacob Levnon, a VP at AWS, was famous for saying, “There is no compression algorithm for experience.” I also do a lot of mental preparation by reading lap notes, watching videos of professional drivers, and working with my coaches. I’m grateful for the opportunity to be able to race this season and thank those that have helped me on this journey, both at AWS Security and on the racetrack.